This is a cocktail with history, connecting the Spanish American War with pre-revolutionary Cuba. But Remember the Maine is also a great drink capable of crossing the Atlantic to Scottish shores, says gaz regan. Charles H Baker Jr, an American journalist who counted Ernest Hemingway and Errol Flynn among his many friends, wrote for magazines such as Gourmet, Esquire and Town and Country, and was described by Margaria Fichtner, a columnist for the Miami Herald, as having an ‘unquenchable enthusiasm for what he called “the gentle art of imbibation”’. He was also a man who knew how to put a sentence together. Baker writes in his 1939 book, The Gentleman's Companion: An Exotic Drinking Book. Dem’s words as paints a picture, huh? Baker was also a stickler for details. So much so, in fact, that in the case of Remember the Maine, a drink he sampled during the 1933 uprising in Havana, he instructed that it must be stirred ‘briskly in a clock-wise fashion’. If you say so, Mr. Baker, thy will shall be done! and it makes me happy to know that, while bombs were exploding all around and an uprising was taking place in Cuba, Baker had both the time and the inclination to relax over a nice cocktail. The name of the drink, by the way, refers back to the sinking of the American battleship, The Maine, in 1898, during the Spanish American War, and it’s taken from the rallying cry of Americans of the time, who chanted: ‘Remember the Maine; to hell with Spain!’ in the streets of America. You might want to play around with this cocktail to make it suit your individual senses, and there’s nothing wrong with that. Switch out the rye and use Bourbon instead, if you like. The drink will be a little sweeter, of course, but your choice of Bourbon will also come into play here. Remember the Maine made with Buffalo Trace, for instance, will be a far cry from a Bulleitt Bourbon-based drink. 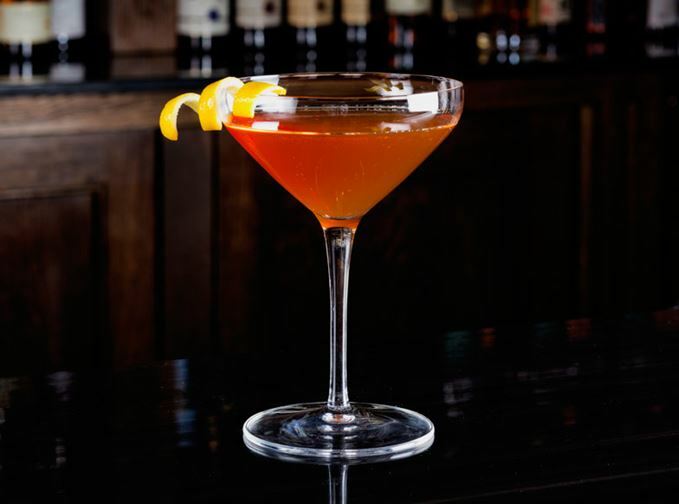 With a nod to Charles H Baker, Jr., I fiddled with his drink to make it a little more Scotch-friendly, and I named this version Remember the Annie Jane after a ship that sank in the Outer Hebrides in 1853. The absinthe is an ingredient to watch out for here, too – add too much and it will take complete control of the glass. And if you don’t add enough, you’ll miss out on the complexity that the Green Fairy adds to the drink. Whatever you do with the ingredients, though, make sure that you stir this drink briskly in a clock-wise fashion, lest the wrath of the ghost of Charles H Baker Jr be visited on you. Fill a mixing glass two-thirds full of ice and add all of the ingredients. Stir, in a clock-wise fashion, for approximately 30 seconds. Strain into a chilled cocktail glass. Add the garnish.